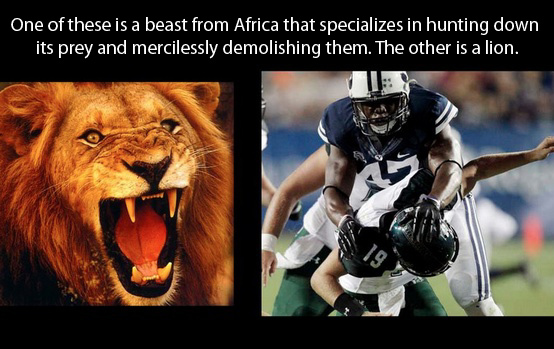 I love Ziggy Ansah's story. He went from never having even seen a football game 4 years ago to becoming the #5 overall pick in the NFL draft to the Detroit Lions this week, tying Jim McMahon as the highest drafted Cougar EVER. I met Ziggy briefly at the Cougar Kickoff last August, and he was very quiet and unassuming; the kind of guy who, when you ask for an autograph, seems surprised and wonders why anyone would ever want his John Hancock. He's very humble, very quiet, and yet he's a beast on the football field. I proudly display all the autographs I got on that day on one of the many BYU sports posters on my bedroom wall, and Ziggy's is right next to his best friend's, the one and only Kyle Van Noy. I found this article interesting, which compares Ziggy to Jimmer. A lot of Ziggy's success depends on how his teammates and the fans in Detroit react to him. Will there be jealousy? Will he have a hard time breaking out of the BYU Bubble? I hope, no matter what happens, that Ziggy will be happy and continue to love playing football. I don't know hardly anything about pro football, but I can't imagine that the Lions are a bigger mess than the Kings, so I think Ziggy is in good hands. He meets a need that they have, and hopefully he will be able to produce to his full potential. One particularly good sign is that the Lion's head coach, Jim Schwartz, talks so highly about Ziggy (a stark contrast to Kieth Smart's complete lack of respect for Jimmer). Schwartz said (speaking of working with Ziggy during the senior bowl), "Probably the best thing that we went through was just getting to know him as a person. [He's] the right kind of guy for Detroit; a hard working, humble guy who respects the game and respects what it takes to get here." I also had no idea Ziggy had such a great sense of humor. He got a lot of flack for wearing Real-D 3D glasses at the draft (which apparently was the result of a bet with some of his friends), but I thought it was hilarious (and most BYU fans would agree). In one of his first interviews with the media after being drafted, Ziggy was asked if it was hard for him to leave his home country and his family to come to BYU. His answer: "I didn't hesitate. My mother was crying when I was leaving, and I was like, I'll see ya later!" Even better was his answer to the question of whether, as a defensive end, he hates quarterbacks: "I don't know if I want to use the word 'hate' because you can't concentrate if you hate somebody. But if you love somebody, you want to grab them, so I love quarterbacks!" You go right ahead and hug those quarterbacks, Ziggy! He's so awesome. He also said, "I'm not trying to play like anybody else. I want to play like Ziggy. I set my own standards." And play like Ziggy, he should. I hope he is wildly successful and becomes the next former Cougar to get a Super Bowl ring. Way to go, boys! You represent Brigham Young University well. I hope they let me play Ziggy in the Movie "The Blind Side Part 2". Ziggy is the man and Detroit is lucky. I do however have one complaint to file against this article. You are using the term "former Cougar". I disagree with that. You can ask Brady Poppinga if you want but once a Cougar always a Cougar. It is one of those offices you NEVER get released from. I stand corrected. He's definitely a Cougar for life! And yeah, I get you and Ziggy mixed up all the time, so you could definitely play him in a movie . . . or not.